How Long Will My Dentures in Annapolis Last? Did you know that dentures have been used for hundreds of years? Thankfully, modern dentistry offers the best looking and performing dentures to date. Dentures are an investment you make for a better looking and feeling smile, but do you know how long they last? 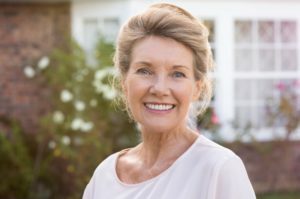 Keep reading to discover the answer as well as some easy tips on how to increase the lifespan of your dentures in Annapolis. Dentures are built to last around 6 to 7 years, but how long before they need replacing will be based on how well they are taken care of. 1 in 4 people above the ages of 65 have a set of full or partial dentures, so they’re still a commonly used dental restoration. How Can I Increase the Lifespan of My Dentures? Although dentures are somewhat durable, always handle them over a thick folded cloth or full sink of water. That way, if you accidentally drop them, your dentures will have something to break the fall. Just like your natural teeth, dentures need to be cleaned everyday to get rid of food debris and plaque. It is important that you use a denture brush instead of a normal one for a more thorough cleaning. You should also never use toothpaste because its abrasive qualities can cause scratches on your prosthesis. It’s best to wash your dentures after each time you eat. So, if you can’t use toothpaste, how do you clean your dentures? Hand soap or mild dishwashing soap is ideal for denture cleaning. There are also ultrasonic denture cleaners on the market that use sound waves and water to clean your prosthesis. However, neither of these methods should replace the daily brushing of your dentures. Your dentures still require care when they’re not being worn to make sure they last long! To prevent them from drying out or losing their shape, keep them in denture cleansing solution or water. Just avoid using hot water because it can warp your prosthesis. Be sure to always clean your gums, tongue, and mouth before putting in your dentures. Even if you have partial dentures, they should be removed to brush your remaining natural teeth. You can also gargle warm salted water each day to wash your gums. Last but not least, visit your dentist every 6 months to make sure your dentures are still fitting and functional. Your dentist in Annapolis will also check for early signs of dental issues like gum disease. Now that you know how long your prosthesis will last, use the above tips to get the most out of your dentures for a health and happy smile. At Goodman Dental Care, we have a dedicated father and son team who take pride in providing quality care to their patients. Drs. Gary and Jeremy Goodman both take continuing education courses to stay up-to-date on the latest techniques in dentistry. For any questions, they can be contacted through their website or by phone at (410) 263-1919. Comments Off on How Long Will My Dentures in Annapolis Last?